NO PURCHASE NECESSARY. To enter, submit an original magic item (which must be a wondrous item, magic armor, or magic weapon) using the format shown in the Pathfinder Roleplaying Game Core Rulebook (this format is available free on the Pathfinder Roleplaying Game Reference Document). More specific details are in the Open Call Rules. The entry period begins at 12:00 PM Pacific time on August 7, 2015, and ends at 11:59 PM Pacific time on August 16, 2015. Entries must be submitted through the official entry form at paizo.com/rpgsuperstar. Contestants must have an account on paizo.com to enter the contest—visit secure.paizo.com/paizo/account to set up a free account. Entries will not be accepted by mail, e-mail, telephone, fax, or any other method. There are no exceptions to this requirement. Incomplete entries, entries over the word limit, and entries not conforming to the Pathfinder Roleplaying Game will be disqualified. All entries become the property of Paizo Inc. Paizo is not responsible for lost entries. Public voting on magic items begins at 12:00 PM Pacific time on August 17, 2015 and ends at 11:59 PM Pacific time on August 30, 2015. The top 32 entries, as selected by voters, may proceed to further contest rounds with additional requirements. The requirements of subsequent rounds must be met by the contestants in order to maintain eligibility for any prizes. The contest is open to the general public, with the following exceptions: Employees of Paizo, their immediate family members, and persons with whom such employees are domiciled are ineligible. Anyone who has been employed full-time as a designer for a game company is ineligible. Anyone with a cover credit on a hardcover RPG book is ineligible. Anyone who has a design credit in 3 or more of Paizo's Pathfinder products is ineligible. 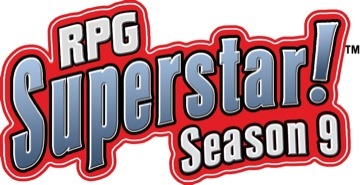 The top 8 finalists of all previous RPG Superstar™ contests are ineligible. Contestants must provide their real names on their paizo.com accounts. Legal identification must be produced on request. One entry per person. Anyone found submitting more than one entry will be disqualified and any prizes won will be immediately forfeited. By entering this contest, the contestant authorizes the use, without additional compensation, of his or her name, likeness, voice, photograph, and municipality of residence for promotion and/or advertising purposes in any manner and in any medium (including, without limitation, radio broadcasts, newspapers, and other publications, and in television or film releases, slides, videotape, distribution over the internet and picture data storage) which Paizo may deem appropriate. By entering this contest, contestant agree that they may be selected to participate in portions of the contest that include public discussion and public voting. Contestants agree that while Paizo has guidelines for messageboard conduct, the contestant will indemnify and hold blameless Paizo and all of its affiliates, judges, participants, and customers for any comments, discussion, or other communication pertaining to the contest. During public voting rounds, contestants are prohibited from any public discussion that could be considered as adding to, expanding upon, or clarifying the content of their current submissions. This applies to (but is not limited to) interviews, personal blogs, and messageboard posts on paizo.com or elsewhere, including the paizo.com discussion thread for the entry itself. Any such discussion may result in disqualification, in the sole discretion of the judges and/or Paizo. Contestants must agree to the submission agreement found on the submission form during the entry period. The Grand Prize is the opportunity for a paid commission to write an adventure for a product in Paizo's Pathfinder Modules line. The winner must sign a contract to write an adventure as prepared and accepted by Paizo. The final adventure must be written in the English language, following the Pathfinder RPG rules set, and must be written with proper spelling and grammar. The winner must fulfill his or her obligation to write an adventure acceptable to Paizo before getting paid for this work. Winning the RPG Superstar™ contest does not guarantee the winner payment if he or she doesn't fulfill the obligation to write the adventure or can't deliver an adventure that meets Paizo's quality standards. The other three finalists gain the opportunity for a paid commission to write a 16-page adventure for Paizo's Pathfinder Society Scenario line. The finalists must sign a contract to write an adventure as prepared and accepted by Paizo. The final adventure must be written in the English language, following the Pathfinder RPG rules set, and must be written with proper spelling and grammar. The finalists must fulfill their obligations to write an adventure acceptable to Paizo before getting paid for their work. Being an RPG Superstar™ finalist does not guarantee the finalists payment if they don't fulfill their obligation to write the adventure or can't deliver an adventure that meets Paizo's quality standards. In accepting a prize, the winner or finalist acknowledges that Paizo may not be held liable for any loss, damage, or injury associated with accepting this prize. Paizo retains the right, in its absolute and sole discretion, to make substitutions of equivalent kind or approximate value to the winner's or finalist's prize in the event of the unsuitability of any part of the prize for any reason whatsoever. Approximate value of the Grand Prize is subject to the word count of the final commissioned adventure. This contest is subject to federal, state, and local laws where applicable. Paizo reserves the right to withdraw or terminate this contest at any time without prior notice. The winner and finalists are responsible for any local, state, and federal taxes owed due to their participation in this contest. Decisions of Paizo and the contest judges are final.